Another week of running is in the books and I am rapidly approaching my next half marathon! Monday: I did some light core work after class, but not enough to be considered a full-blown workout. I also had quite a bit of reading for class, so I focused more on that. Tuesday: Early morning four miler. It was a little warm, but not too bad. The rest of the day was my typical work then school format. Wednesday: I did not workout because I was finishing up my third paper due for my Wednesday night class. The professor gave us the night off of class to work on the paper and I wanted to make sure that the paper was written at a substantial level. Thursday: I opted for extra sleep and one last tweak of my paper, so I ran after work. It was rather hot, but the run felt good. Afterwards, we tried the new Mellow Mushroom by our house. It just opened, but the service was TERRIBLE and waiting 50 minutes for a small pizza is really unacceptable. Especially when you order three small pizzas and get three pizzas in three different sizes. Boo, the Dodgers won. Kris Medlen had another rough postseason start. Friday: I did the Spartan Ab 100 again, and I might finally be remembering the entire routine without constantly checking my iPhone. Yay, the Braves won! Mike Minor might be the ace of the staff again! 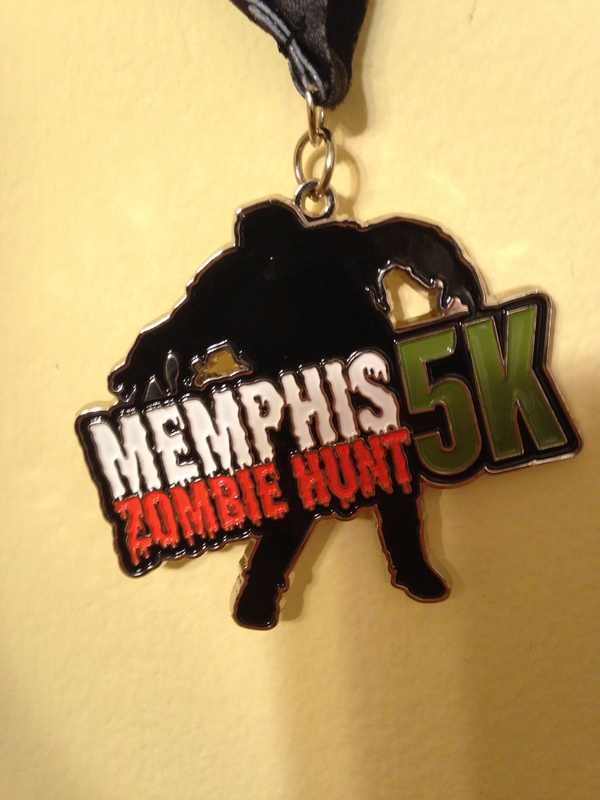 Saturday: I ran two races, the Tap ‘N Run Memphis and the Memphis Zombie Hunt 5K. It might have been three, but Susan was leaving for the beach, so I opted to see her off. I will do individual race recaps sometime this week. I will say, however, that the weather was drastically different for the two races, and I actually finished seventh in my age group for the Zombie Hunt 5K! Also, were there any two teams in the country that lost in a more heart breaking way than the Memphis Tigers and Tennessee Volunteers did? Memphis lost two fumbles for TD’s in the last two minutes of the game, one at least should have been overturned by replay, and then the would be tying kickoff return TD was negated by a rather weak holding call. Tennessee, huge underdogs, had a late lead in the fourth quarter, but allowed Georgia to tie it to force OT. Then they fumbled the ball out of the end zone while trying to score the go ahead TD. The Vols might be cursed. The Smokey Grey uniforms looked good, but they should probably match the helmets to them in the future. Sunday: I ran the longest distance of my life by completing fifteen miles! It was not as great of a long run as my last one, but I completed it and that is all that matters. I am building towards the WDW Marathon and the mileage will certainly help me for the Four Bridges Half Marathon in two weeks. The weather was chilly and overcast at the beginning of my run, and by the end three hours later, it was hot and sunny. I got a little bit of a sunburn, but I maintained hydration throughout. Damn, the Dodgers beat the hell out of the Braves. This was quite a depressing game. There is still hope though! Just win the next two! The Broncos and Cowboys game was the game of the year in the NFL, and of course the Cowboys came up short due to a Tony Romo interception. He played amazingly until the last drive and was on his way to the NFL single game passing record. Then he Romo’d and the Broncos won 51-48. Watching the Cowboys builds character, I suppose. The Titans really need Jake Locker to return from his hip injury. They looked terrible on offense without him. This was the first week since the end of Breaking Bad, so there was a void in TV, but at least The Walking Dead returns next Sunday night. I did a better job of working in some cross-training this week, even if I did not do quite as much as I wanted or needed to. After last week’s weather reprieve, the temperatures crept back up this week, but thankfully the humidity did not. Hopefully the temps will trend back down next week, and the humidity will remain low because I am about to embark on my biggest stretch of races of the year as well as approaching new distance territories with my marathon training. Monday: This was a designed rest day. This was the beginning of my busy week of work, as well as a full week of class assignments, so every extra second was appreciated. Tuesday: An early morning run to get the day off on the right foot. I felt good on the run and used it as an easy forty minutes away from worrying about school and work. Wednesday: On the exercise front, I was a complete slacker. I had every intention to do some TRX after class, but I just zonked out instead. I did, however, get my second A in my Wednesday night class, which is my most difficult class! Therefore, 9% of my grade is an A, which is great, but now I have more pressure to keep up with the momentum. Thursday: Another early morning run at an easy pace for four miles. This is going to be my routine for the foreseeable future, and yet, waking up by 5:30 am is not getting any easier! Friday: I finally did something besides run or be lazy! I did an intense, all body TRX workout after work, and I immediately noticed that my recent slacking was taking its toll on my body. This was a jarring reminder that I am better served with a couple of non-running workouts per week, and that I can find time for these. After my TRX routine, I decided to embrace my Spartan Race training advice and headed outside for some burpees. I wanted to do thirty since that is the penalty for skipping a Spartan obstacle, and while I attempted thirty burpees, twenty-five of them would be in the running for the worst burpee of all time! Saturday: This was my “long” run day, and since I am following the Jeff Galloway training plan, this called for a four mile run. No worries, next week will be a fifteen miler, so I will definitely be building my mileage base! The rest of the day consisted of college football and some beer. Sunday: No workouts, but I stayed busy working on a paper for class this week. It is my third writing assignment in this same class, and the pressure is on to make another A. We shall see how it goes. Sunday night marked the end of the best TV show of all time, Breaking Bad. 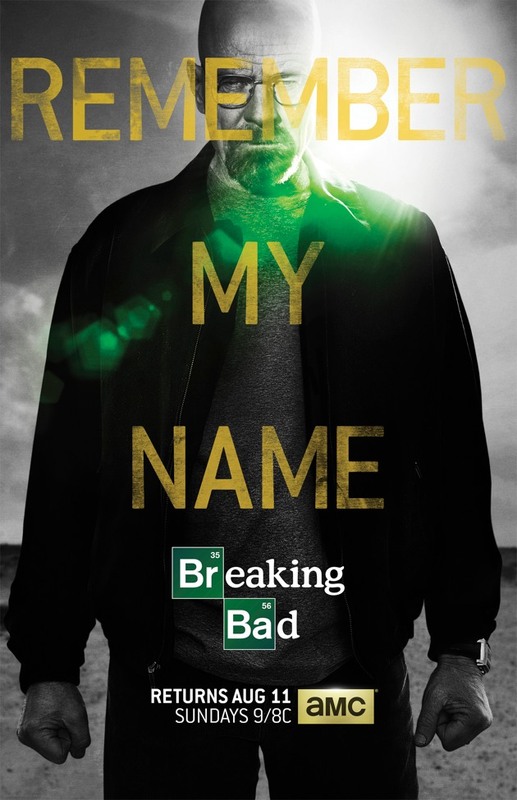 I am not going to spoil the episode, but I must say that Vince Gilligan knows how to end a show. It was a perfect ending to an outstanding show and certainly lived up to the hype. Another week of training and grad school is in the books. I am a couple of weeks away from my next race and I am finally getting a little bit of a balance in my schedule. Monday: No run or class, rather, I had to to go to an information session on a study abroad opportunity in Cuba over spring break. Whereas it is an unique opportunity, I do not know if I want to spend the time or money on the experience. We shall see. After the session, I did my Spartan 100 core focused workout. Twenty minutes of core focused moves will hopefully lead to stronger runs down the line. Tuesday: Early morning run that was a little on the humid side, but it was nothing unbearable. It was an easy 4.29 mile training run. I also did not have to attend class, but rather submit an online discussion question. I could get used to grad school courses like this! Wednesday: Busy day of work that led to my only night of grad school class for the week. I did receive some good news during the class being that I got back last week’s paper, which I was able to score an A on! So my first official grad school grade was an A, so hopefully there will be many more to come! Thursday: I decided that I wanted to sleep in so I had to go for my run after work. It was quite hot, so I ended up running my four plus miles at 8:30 pm, which always makes Susan a little uneasy. I probably need to invest in some reflective/night gear. Friday: I was lazy and did not workout. It was an all around boring, uneventful day. We did get some much needed rain in Memphis. Saturday: Susan and I worked in the yard most of the day. 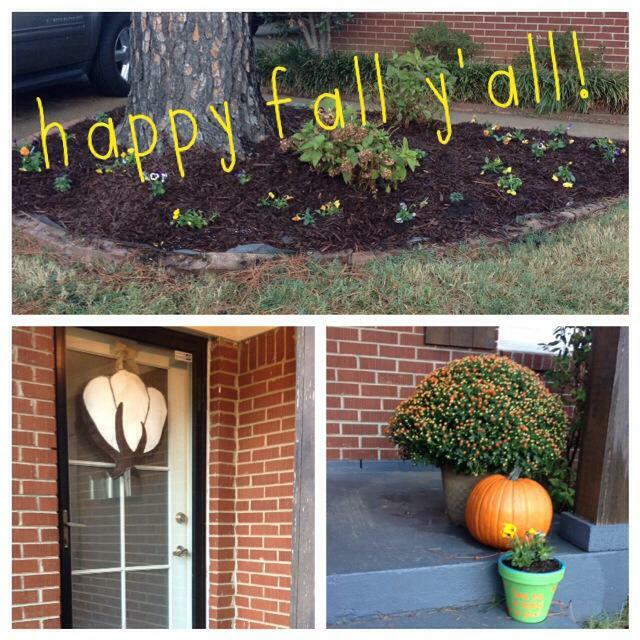 Our front flowerbed was in terrible shape, and Susan thought it was time to make out house “fall ready”, especially since Friday’s rain cooled off the weather for a couple of days. We ended up planting 36 pansies, a mum, and laid some mulch. I also raked the front yard and did some general yard cleaning. I did not go to the gym or run since we were doing yard work. The Braves finally clinched the east! Sunday: I ran what was the easiest thirteen miles of my life! It was not my fastest time, but I felt great upon completion and was able to stay mentally strong. I would like to think that my training is paying dividends, but I am also certain that the drop in the heat and humidity also aided in that effort. After the run, Susan and I met a friend that was visiting from Atlanta for brunch at Local on the Square. I had my favorite, the chicken and waffles and Susan tried the lobster stuffed avocado, which was amazing. It was an avocado covered in Panko bread crumbs and fried, then stuffed with the lobster salad. I also helped myself to a Samuel Adams Oktoberfest and the Oktoberfest offering from Ghost River Brewing, a local brewery. The Ghost River offering would have been better if the keg would have been properly cooled. 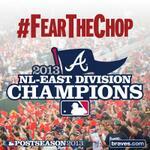 Speaking of Atlanta, the Braves finally clinched the NL East! They are officially in the playoffs now and not in that dumb, wild west one game, winner take all wild card game. This is the sixteenth time in my life that the Braves have won their division, which is quite exceptional. It was another good episode of Breaking Bad and there is only one more episode to go the greatest TV show of all time. My updates have not been coming at an acceptable pace, this I know. I am going to try to do a better job of writing this week. I think that I have finally gotten into a rhythm with class, work, my personal life, and running. So to get back into the swing of things, let me catch you up on my last week. Monday: I did not run, but I did one of the Spartan Race Workouts of the Day that focused on my core. I did some side crunches, planks, pushups, bicycles, and such for about half an hour. Focusing on my core will be vital moving forward for my marathon aspirations. Tuesday: I woke up early and went for the first run of the week. I completed 3.81 miles slower than I was expecting, but the heat and humidity was insane. At 5:30 am, the temperature was already over 80 and the humidity was close to this number. Can it be December yet? Also, Sons of Anarchy returned and while it is not as good as Breaking Bad or several other dramas on TV now, it still is one that I am rather addicted to. Hopefully season six is better than season five was. Wednesday: My first grad school paper was due and I am very eager to see how I did on it. It has been a considerable amount of time since I graduated from college and I am having to learn a new style of writing. I am cautiously optimistic about how I did. After class, I was mentally zapped, so I watched It’s Always Sunny in Philadelphia and The League, and did no workout. Thursday: Another early morning run in high heat and humidity. My pace was a little better and I logged 4.24 miles. After work, I rotated homework for my Monday night class and some TRX. It was not my best TRX session ever, but it was better than nothing. Friday: I ran in the Cooper Young Festival 4 Miler (my recap will be posted sometime this week) and I had a great race. I beat my previous four mile race PR by about four minutes! The weather was great and the race was well organized. I will leave it at this until I post my full recap. Saturday: No workout, but I did do quite a bit of walking at the Cooper Young Festival with Susan and one of her friends. We did not buy much, but I did score one of my favorite shirts of all-time! Susan and I had seen a picture of the shirt before, but acquiring it proved to be quite elusive, but I knew it would be at the festival and it was my mission to find it. After the festival, we went to Local on the Square, where I had some amazing chicken and waffles. College football was not kind to the Tennessee Vols or Memphis Tigers, but Susan’s Ole Miss Rebels looked good against Texas. 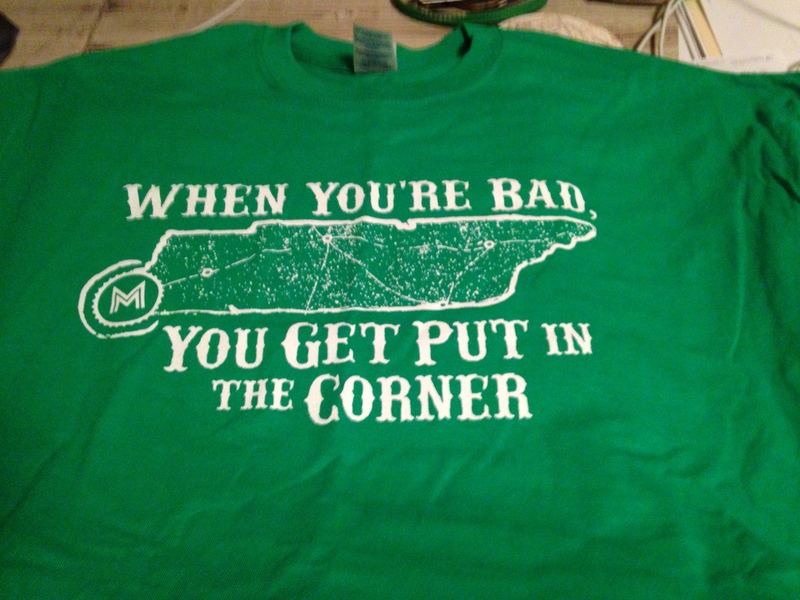 This is such a great shirt! Sunday: Another early morning run, but since I am doing the Jeff Galloway plan, it was a short one. However, I really should not have done a run at all, but only running three days a week, especially on the short weeks is hard to do. That might change as my mileage ramps up. It was a cooler morning than my last couple of early morning runs, which was greatly appreciated. And it made my 4.28 miles very pleasant. My neighbor did deliver some bad news when he said that someone tried to break into his house this week. Wednesday around 7:00 pm, his daughters caught two minute lurking around their front window. This same night, someone knocked very aggressively on our door, but Susan did not answer. Having a loud dog probably helped urge the people to move along. Not a single team that I root for won today, so that is a bummer, but hopefully the Braves can win at least two of their next three games so they can clinch the NL East in Washington. I am not sure my heart can handle two more weeks of Breaking Bad if they are going to be this intense! The show is without a shadow of a doubt the best show in TV history. I would also like to thank the NFL for the one hour weather delay that perfectly coincided with Breaking Bad tonight. I usually try to post this update on Sundays, but yesterday was quite busy for me, so here it goes a day late. My last week of Tupelo 14.2 high intensity training is now over. Now all that is left is is a couple of weeks of tapering and then it will finally be race day. It has been quite a humid week here in Memphis, and very uncomfortable for the longest run of my training. Monday: I went for my run after work, so the heat I encountered was completely my fault, but the humidity was insane that morning and I needed the extra rest. The first half mile or so, I ran with my dog. He is a miniature labradoodle, and I never run hard for more than this distance with him. After dropping him off, I hit my normal course and had a good run. Tuesday: No run, but I did a forty-five minute TRX routine. I rotated through the upper body, core, and lower body exercises. I really wish I had a place in my yard that I could suspend my TRX straps overhead so I would have the full gambit of exercises at my disposal, but I still can get a great workout in regardless. I am, however, considering getting a pullup bar that you can put up in a door frame so I can work on doing something that I have never been able to do in my entire life, a pullup. I feel that it will be very beneficial for my upcoming Spartan Race. Wednesday: I was lazy and did not get out of bed for a morning run. After work, my in-laws decided to take Susan and I out for an early birthday dinner. We went to Side Street Grill in Midtown for their steak night. Steak night is a fantastic deal, with two steaks, two sides, two salads, and a shared appetizer for $28! And we are not talking sirloins here, but rather filet mignon in generous proportions. It very well may be the best deal in town. This was a very comprehensive routine, but there was quite a bit of a learning curve for the majority of the exercises, and the next time I do it, there will be quite a bit more speed to it. I will say that my soreness factor was not what I was expecting, so I do feel the pauses to verify my technique was a part of that. Thursday: I woke up early and finished four and a half miles on a brutal morning. At 5:30 am, it was 80 degrees, the dew point was 75, and the humidity was at 88%. Welcome to Memphis in August! Actually, I guess I should be thankful since there has not been an official day at 100 degrees or higher here in Memphis yet, which feels like a record. I was drenched after my run and was definitely feeling the wrath of the weather when I returned home. All I can say is at least I was not running in the blistering sun, so it could have always been worse. Friday: It was Susan’s birthday, so I did not workout. I opted to spend the day with her. I took a long lunch and met her at work so I could have lunch with her, I gave her some birthday presents, we went to dinner, and then we watched a movie. I was going to take her to a movie, but she wanted to stay at home and watch Harry Potter and the Sorcerer’s Stone. It was her birthday and her choice, so I can no longer say that I am in the minority of the world to never see or read any of the Harry Potter stories. Oh well. 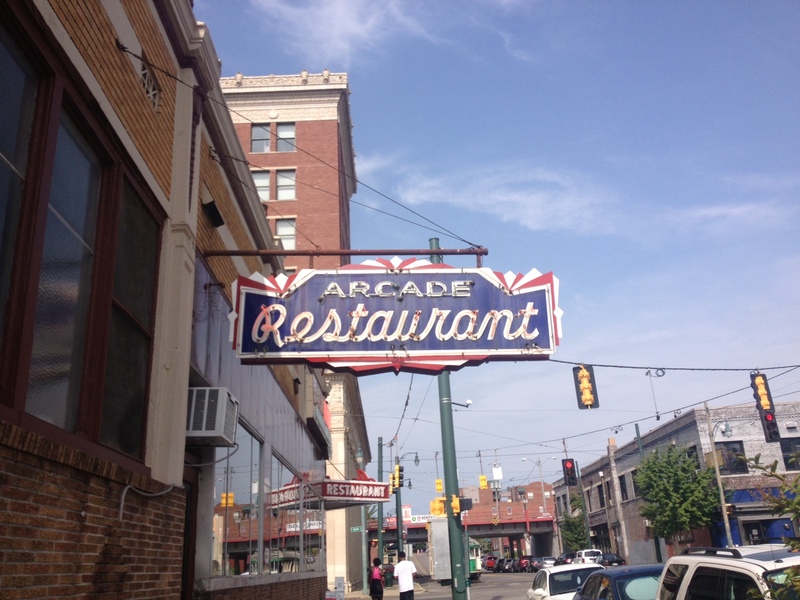 Saturday: Honestly, I should have gone for my long run, but we had already made plans to meet some friends for breakfast at a local institution, The Arcade. Susan has lived here her whole life and I have lived here for about a third of mine (wow, I have been here that long? ), yet we had never tried the place out. I will say that after eating there, the place is worth the hype. I had what is called the “Eggs Redneck” which is biscuits and sausage smothered in gravy with hash browns and eggs. It was not the healthiest meal of my week, but it was very delicious. 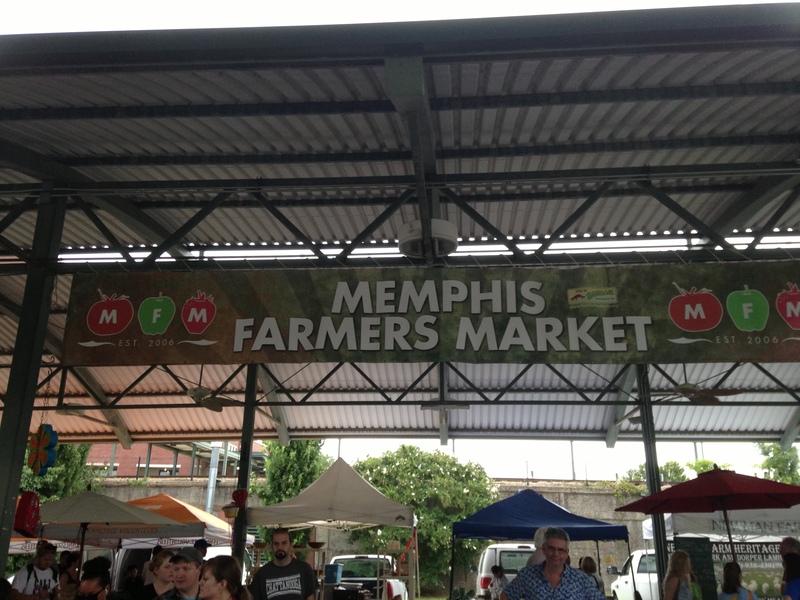 After breakfast, Susan and I went to the farmers market around the corner. The place was packed with vendors and shoppers, and there were some local food trucks there as well. 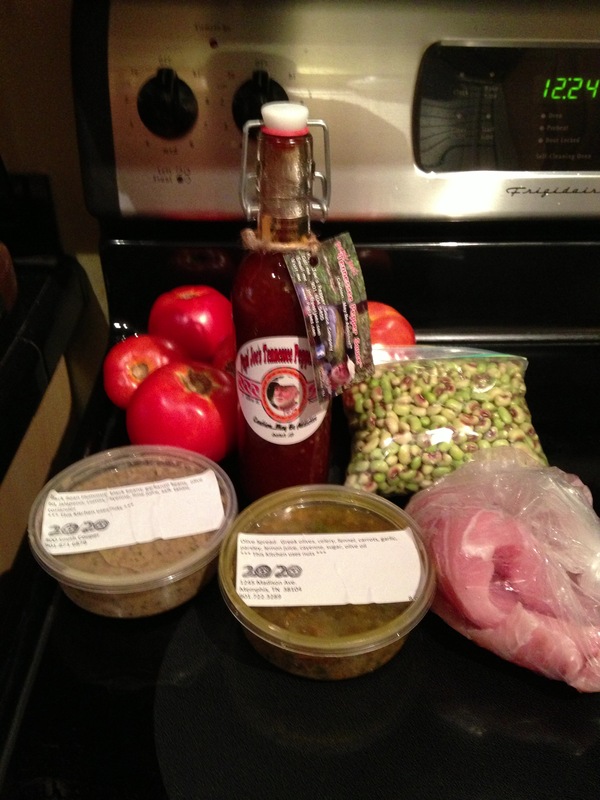 We bought some locally made hot sauce, a pound of triple stripe, some tomatoes, olive spread, and hummus, which led to a fantastic grilled dinner later in the day. I could not stand the thought of two days in a row without a workout, so I did another TRX routine. This was a shorter one, and I finished with my last set a mere twenty-five minutes after I began my warmup routine. It is very convenient to have the ability to do TRX at home. But this convenience also eliminates any excuse that I might have about finding time to exercise. After my TRX routine, I mowed my yard, so that hour plus of pushing that mower around the yard can be attributed to being active as well. A great place to spend a Saturday morning. Sadly, the Atlanta Braves incredible win streak came to an end with a wild pitch in the top of the ninth inning against the lowly Miami Marlins. The Braves had rattled off fourteen consecutive wins, and opened up a commanding fifteen and a half game lead on the Washington Nationals! It has been a fantastic couple of weeks of Braves baseball, and hopefully this will be parlayed into a long October run! Sunday: I did not choose well for the day and time for my long run for the week. I woke up at 5:30 am, but the weather outside was already soup like. The humidity sat at 87%, the dew point was 73.9 degrees, and the temperature sat at an even 80 degrees, so I knew I was in for a challenge. I took a very long time to get prepped for my run, trying to get psyched for the weather, and by the time I hit the sidewalk, I was already sweating. I thought that my day, and possibly the next couple of months was over just after mile three. Memphis is a city with numerous trees which is awesome for aesthetics and shade, but can be brutal on my allergies and the local sidewalks. My allergies were mostly in check this morning, but I was not being as mindful as I should have been to the ever changing topography on the sidewalk. I came down very awkwardly on my left foot, causing it and my ankle to pop very loudly and roll inwards. I let out a string of expletives and thought the worst. It took me a couple of minutes to be able to put any weight on it again. After a few more minutes of hobbling around on it, the pain subsided enough for me to take off once again, albeit at a much slower and controlled pace. By the time I reached mile five, there was no more pain in my foot or ankle, which made me extremely happy. I kept sluggishly pushing forward in the hot and humid air until mile eight, when the skies opened up and started pouring some much appreciated cold rain upon me. This lasted for about two and half miles, and they were the fastest two and a half miles that I ran all day! I only had three negative splits for the day, and they were miles eight. nine, and twelve. Thank goodness for that rain! Not only was it refreshing, it also gave me reassurance that my recent lackluster times are more weather related than fitness related. I ran a total of 13.11 miles on Sunday, and since that is a half marathon distance, I used it for a virtual race that I had registered for. The race was The Walking Dead Run, and I only registered for it because the medal company made an error in the color of the race medals, so they were redoing several of them. 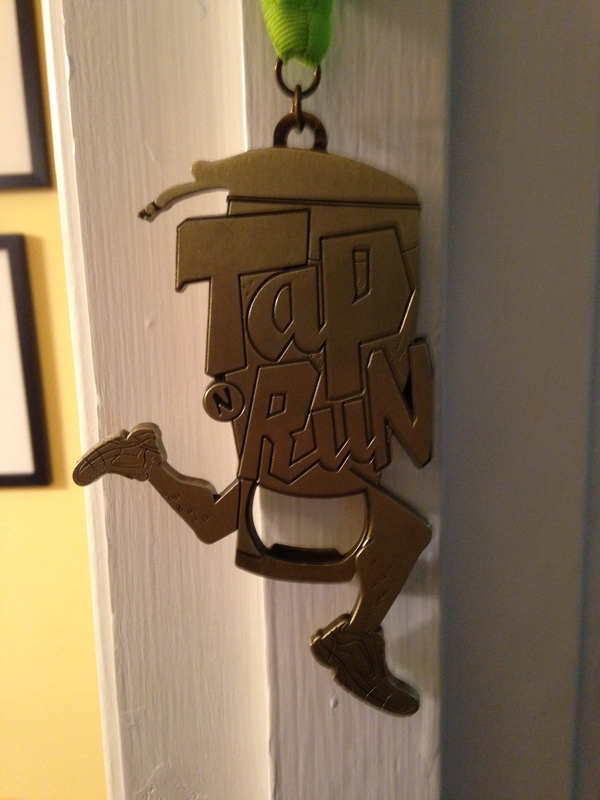 The race organizer was trying to get rid of the extra medals, and was asking for a $10 donation to their race charity. 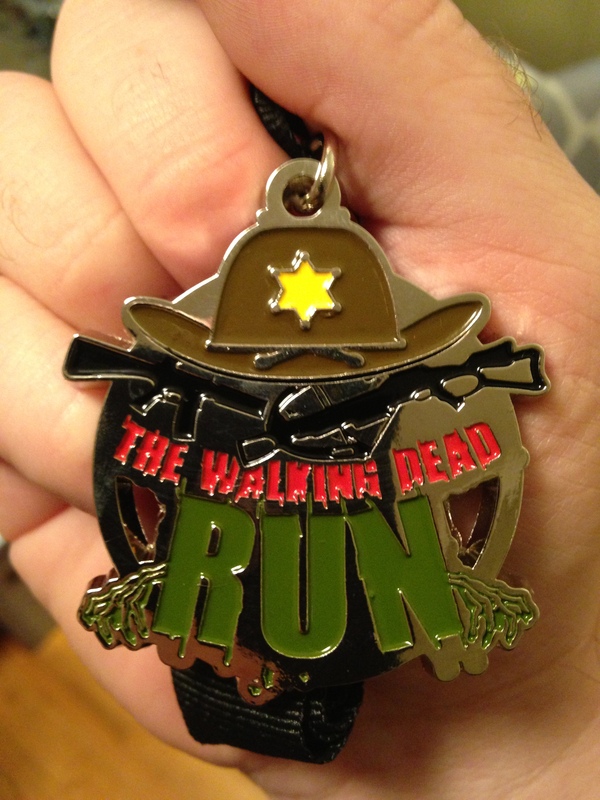 I love the show The Walking Dead, and I actually like the incorrect medals better than the correct ones, so I pledged my $10. I will say though, that unless a race blows me away in the next few months, that this is my second to last virtual run for the foreseeable future. I am sure Susan will be happy with this. I mean, I have to start saving for Disney in January and finalize which races I want to run next year, so the extra capital would be great. My friends and I play trivia at a local bar on Tuesday nights. It is an excuse to get out of the house for a couple of hours a week, and an easy way to make a few dollars for our tabs each week. Each week, the winners get a $50 gift card to the bar, second gets $20, and third gets $10. Since May, our team has amassed a little of $600 in bar cash, which definitely puts us in the black for our trips there each Tuesday night. And twice a year, there is a tournament of the area bars that play trivia through Challenge Entertainment. Three years ago we placed second in the area tournament and netted $1,000. Now, second would land us $5,000, and first place gets $10,000! Last night we had our first semifinal round and we placed seventh for the night. We could have won last night since we finished twelve points behind first, got the final answer right, but wagered zero points. We did that because there were no prizes on the line last night and as long as we finished in the top twenty, we would move to the next round. After trivia, I immediately went home and fired up my DVR to catch the premier episode of the new, and final season of Breaking Bad. It is easily the best show on TV and very intense. It is one of the few shows that I will watch live on TV and if I miss it live, I have to avoid Twitter and Facebook until I get to watch it. I will not give any spoilers, but last night did not disappoint one bit! I do not know what the outcome will be for Walter White will be, but watching his evolution over five plus seasons has been staggering. There are only seven weeks left in his story, and certainly several twists yet to come. Can it already be 8:00 pm on next Sunday night yet? Mythbusters tackling Breaking Bad? I had to share this! Yeah science!